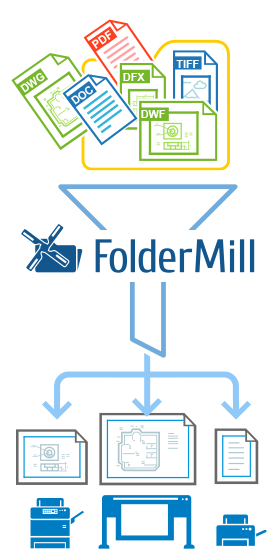 When you place documents into FolderMill's Hot Folder, the program processes all incoming files by default. However, you can pick certain documents and leave out the others - those which don't meet the criteria you've set. If you want certain files to be processed differently in the same Hot Folder, use Actions based on filters. These Actions can include or exclude files from processing depending on filename or page size. Filter-based Actions should be used in combination with other Actions, such as "Print Document", "Convert to image", "Convert to PDF", in order to take effect. If your work is related to design or engineering, technical documentation, CAD / CAE / CAM systems, and you print a lot, this Action may be very useful. It allows you to assign different tasks depending on a type of document with the help of pre-defined paper size filters. Send A4-sized support documentation to a regular MFP (AIO) printer, drawings and images - to a largescale printer, and plot your A1 AutoCAD drawing - on plotter. If you wish to keep a copy of your printouts on your PC - just add another Set of Actions, which would copy certain incoming files to a specific folder and, for example, convert DWG to TIFF or to another format. Filter by Pape Size Action menu lets you set Action parameters - document's page size dimensions and operators "greater", "less", "equal". They will determine, which document will be instantly processed ("Process by paper size") by the following Action, or kept intact in the Hot Folder ("Exclude files by paper size"). This Action gives you a great variety of processing options - you can send certain documents to different printers and/or printer trays, or convert them to image or PDF, copy, rename files, add a watermark or run a script file especially and only for selected documents. Start file processing by pressing the "Start button"
NOTE: Please mind the sequence of Actions. Process only size = "210 x 297 mm" Action goes first in the example above, therefore only files of A4 will be printed, and any others will be ignored. If you need to set, for example, a strict range of documents based on page size, you can simply set up a delta via two "Filter by paper size" Actions. It may be very useful especially when it comes to printing. Thus, high-quality photographs may be sent to a compact photo printer, whereas regular A4-A3 sized documents - to an MFP (multifunction printer) or all-in-one printer, and all other larger files - to a plotter. You can make your own variations and combine several filters in order to find the best solution for your document flows. If you have any difficulties or questions on filtering files by mask, please don't hesitate to contact us!